1200 sq. m water park (from april to september). 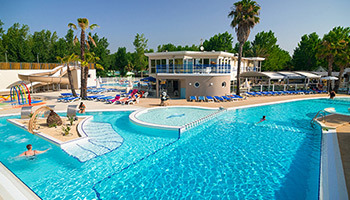 Large pool with balneotherapy, waterslides and fun paddling pool. On one side, Le Napoléon opens onto the main street in Vias-Plage; on the other side, it runs down to the Mediterranean! 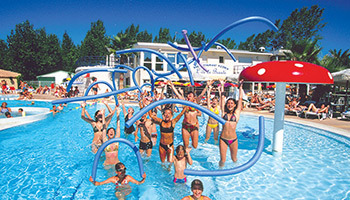 In the scented air of a campsite dotted with trees and flower beds, holiday-makers enjoy a wide choice of activities. Children's mini club, 5 - 11 yrs, 5/7 in July and August. The advantages : Semi-covered raised wooden terrace. Living room, convertible into bedroom for 2 people (children). The 600 sq.m swimming pool complex will keep young and old happily occupied for hours, with a large pool and jacuzzi, sauna, steam room, children's pool and sun deck. 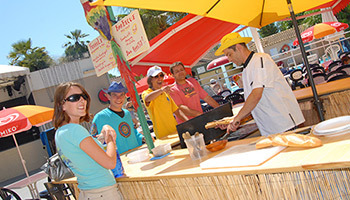 For your everyday needs, you'll find a baker's, laundry, shops, bar and restaurant on site, and a supermarket nearby. Welness center open in july and august. Likewise, the holiday club has something for everyone: a mini-club for kids, activities for teens, and other sports, games, fitness (free) and tournaments for adults. Not forgetting all the fun of the night life, with a varied entertainment line-up every day (in July and August), as well as a bar with music, a pub and a disco (nearby) to keep the good times rolling. 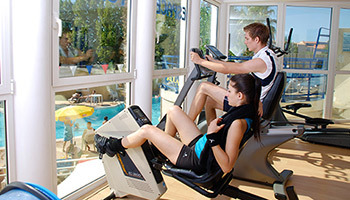 Fitness: aquarobics, fitness training, aerobics, etc. Theme evenings: karaoke, games, dances, etc. The Canal du Midi links the Garonne River to the Mediterranean Sea. Along with the Garonne's lateral canal, it provides a navigable channel from the Atlantic to the Mediterranean. The Roque-Haute volcano is now a 160ha nature reserve. Its natural environment boasts a profusion of flora and fauna. This unspoilt Mediterranean village is set in a protected natural area. The Canal du Midi crosses Vias from east to west, and the village also has over 90km of waymarked trails for mountain bikers. This seaside resort has vast stretches of sand and offers all the fun of water sports on the Mediterranean. Elegant fortified church built in basalt from Agde. A9 motorway: exit Agde-Pézénas, towards Béziers. Short distance Expressway (5 kms). Vias - towards Vias Plage. A75 motorway: towards Montpellier. Exit Agde Pézénas, towards Béziers. Expressway at about 5 kms. Vias - towards Vias Plage.